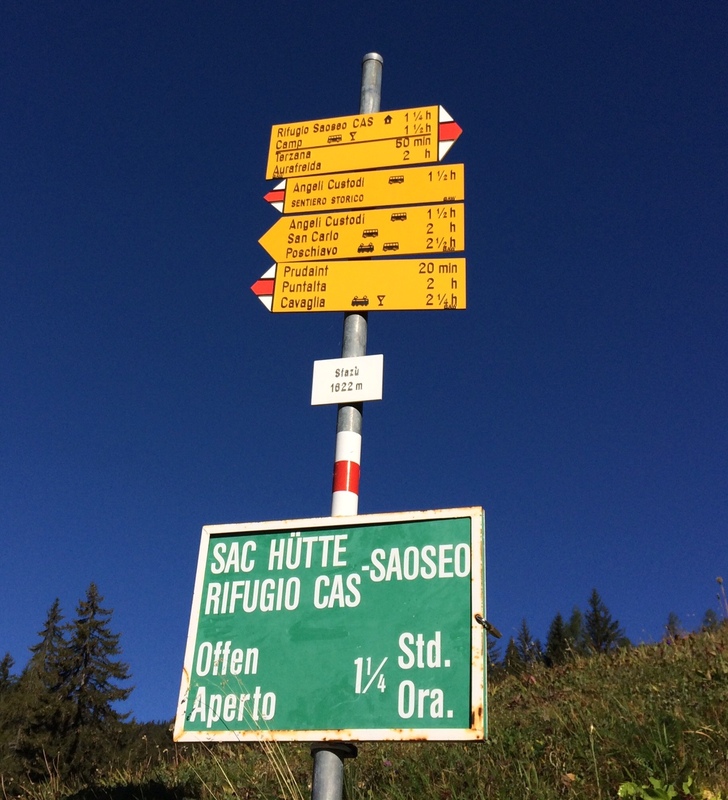 Arrived at Sfazù (1622m), today’s trailhead, by bus from Pontresina. The scenery to get there was already impressive. We passed by the glacier and went through the isolated, lonesome area of the very eastern corner of Switzerland. Mini-buses run to Camp Alp but it was booked out so I walked this one-hour stretch. The sunny weather lured many hikers in the same direction. Soon two Swiss women joined me. We started talking while walking and I found out that one of the women from St. Gallen has a 28-year-old godchild who is a big Japan fan and lives in Nagasaki for 3 years! In our last three hikes my hiking buddy Rieko-san and I met Swiss hikers whose adult children love Japan and learn Japanese. It is an amazing coincidence and I am happy to know that there are so many Japan fans in Switzerland! After passing by Rifugio Saoseo, relatively easily I arrived at the beautiful green lake, Lagh da Val Viola. A great place for picnic lunch and I lazed around for one hour at the lakeside. Today, the Val da Viola circles around the lake in a very autumn colors atmosphere. From the highest point of today’s trail (2258m) I see the snow-capped Piz Palù (but not Piz Bernina!) and the Morteratsch Glacier. The main purpose of this hike was to see the Lake Saoseo, but this part of the trail on this valley was another highlight! After a quite steep and slippery descent, the famous Lagh da Saoseo appeared. I saw a breath-taking photo of this lake two years ago and since then wanted to see it with my own eyes. Apparently, Saoseo is considered to be one of the most beautiful lakes in Graubünden. Painfully cold it was as well, when I put my feet in! Hanging out a long time here enjoying the sun, I left the lake and headed down another route to Sfazu. This route along the stream was beautiful, with small bridges and some isolated typical stone farm houses. As I stayed too long at the lakeside, I just made it to the bus five minutes before it arrived!